The Algerian war for independence against France, which lasted from 1954-1962 was a pivotal episode in the break-up of empire that characterised the last century. Review by Peter Arkell. France had the second largest empire after that of Britain and in the 1950s, having been chased out of Indo-China, politicians of all shades were determined to hang onto Algeria and the other African colonies in order to maintain the country’s great-power status. The political elite hoped they could hold their empire together through a French Union with Algeria and other colonial possessions. This so-called union was based on promises of equality, co-operation and decentralisation of power. This formed part of a long-standing attempt, as Martin Evans explains in Algeria: France’s Undeclared War, to turn colonisation into a civilising mission, to justify it as progressive in certain circumstances. Radical and socialist parties played a key role in developing a “third way” between communism and nationalism in relation to the colonies. This concept was adapted and re-worked by successive governments through the period. The aim was to find a compromise between the hard-line French settlers, who opposed any kind of reform, and the local population who were becoming increasingly impatient, seeing through the real purpose of the ideological smokescreens thrown up by French politicians. This approach was pushed to its limit under the Republican Front government (1956-57) of Guy Mollet, but by the time it fell, the arguments of the reformist politicians associated with it had lost credibility in France and Algeria. After the debacle of the 1956 Anglo-French Suez adventure and the Pyrrhic victory in the Battle of Algiers in the same year, the writing was on the wall. Withdrawal and damage limitation became the goals. Side by side with this examination of the ideas that informed the government of the imperial power, Evans recounts in detail the struggle for power and influence within Algeria. The eventual victory of the Front de Liberation Nationale (FLN) over the other parties was only achieved through brutal internal struggles. The early leaders of the FLN came to the conclusion that only armed insurrection could save Algerian nationalism. French socialists and radicals could not be trusted and nor could any other Algerian resistance movements that treated with them. The key battle was for the minds and hearts of the Algerian people. The ideas of reformism, the promises of elections, greater equality, more jobs, of integration with France (or sometimes assimilation) were what the nationalist movement fought so hard to counter. As an exposé of reformism, the book could hardly be bettered. The history of the clash between the ever-changing French governments and the uncompromising militarised FLN, so important to both countries and to the world, is rigorously researched, placed firmly in the context of the Cold War and of the other liberation movements round the world. However, what is less well explained in the book, but was arguably just as important, was the failure of the Communist parties of either country to have an impact, except a malign one. The opportunity was there for them to cut through the reformist ideology and present a unifying set of perspectives and policies based on the unconditional support for anti-colonial struggles, on the right of self-determination of a people and on the necessity of challenging capitalism as a system in both countries. The huge Communist Party of France (PCF), which won the largest number of votes (over 5 million) in the 1956 election and which at first supported the Republican Front government, did little more than shuffle about somewhere near the corridors of power. The party had became part of the bourgeois political order, a kind of long stop for capitalism. This was the role it was to carry out consistently, most notably in the general strike of 1968 when the PCF became the key instrument for organising the return to work, and with it the resumption of power by General de Gaulle. This betrayal of both the French and colonial masses was, of course, entirely unsurprising and predictable. The internationalist ideas of the 1917 revolution in Russia had long since been snuffed out by the rise of a powerful privileged bureaucracy led by Stalin which then imposed on all its sister parties an agenda that was opposed to revolution. The PCF, which played a prominent role in the resistance to Nazi occupation, was in a position to fight for power at the end of World War Two but was instructed not to. So, tragically, the revolutionary possibility contained within the situation in both France and Algeria was never formulated or put to the people of either country. The PCF exercised a powerful grip which worked against Algerian independence and reinforced backward nationalist sentiments among the French working class. Later on, discussing the consensus across the whole of French society in support of colonialism after the end of World War Two, he writes: “Meanwhile the Communist Party abandoned its anti-colonialism of the pre-1956 and the 1939-41 periods. Like de Gaulle it regarded the preservation of the Empire as crucial to France’s standing in the post-war world.” In other words, it was not possible to stay in the party and actively assist the FLN. 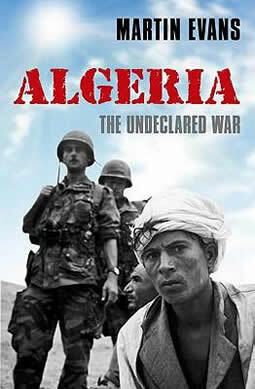 Algeria: France’s Undeclared War by Martin Evans. Oxford University Press. £20.00.